A series of devastating tornadoes, unleashed by enemy mages in the recent war has left all the king's castles in ruin. Only the foundations of these once magnificent monuments remain. The war not only robbed the king of his castles, but also of his youth. The now elderly king must choose a successor from among his sons. He has charged them with rebuilding his castles and promised the throne to the one who can rebuild the tallest and largest castles. Tired of war, the king requires that the building be done in peace and a spirit of cooperation. Thus, the princes may not attack each other or the castles being built. Each prince has 6 knights to supervise the building. 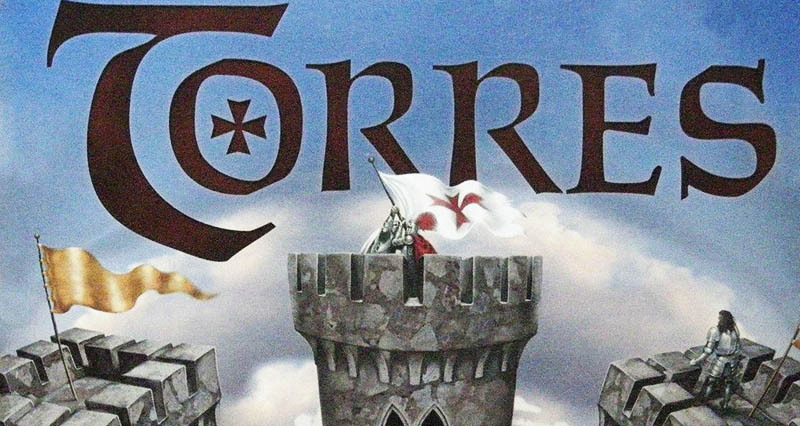 Two or more princes may work together on a castle with their knights competing to control the highest towers of the castle. The king will spend each year in a castle and will reward the prince whose knights are guarding him. Once each year, the king will tour the castles, to judge the progress of each son. After he finishes the third tour, he will choose his successor and prepare for his own death. 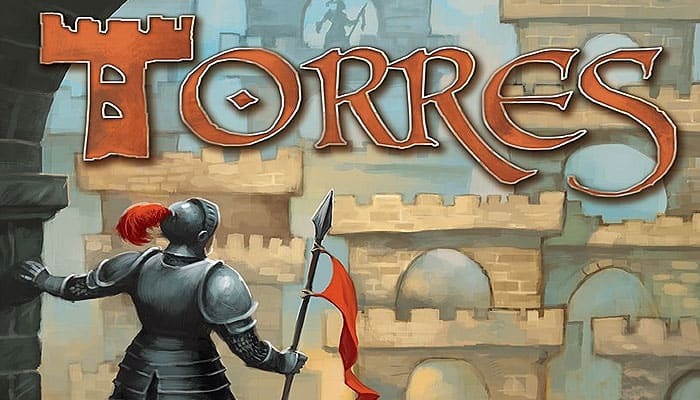 Torres is an abstract game of resource management and tactical pawn movement. 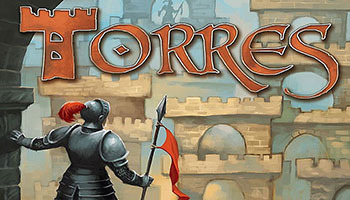 Players are attempting to build up castles and position their knights to score the most points each turn. Players have a limited supply of knights and action cards that allow special actions to be taken. Efficient use of pieces and cards, along with a thoughtful awareness of future possibilities, is the heart of this game. Torres is considered by many to be an informal member of what is referred to as the Mask Trilogy. The board has a scoring track circling the outer edge and an 8 x 8 area for castle building. 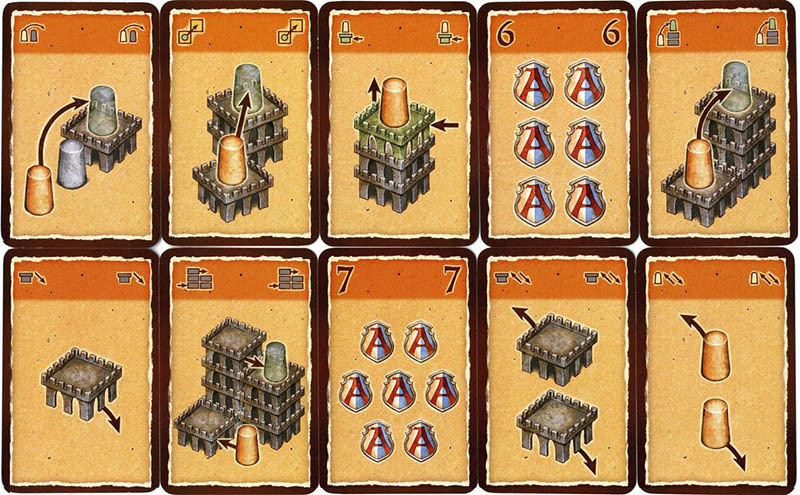 The starting locations for the 8 castles are marked within the castle building area. Instead of placing the starting castles on the spaces shown on the board, the players choose the starting positions. The new space must be an orthogonally adjacent. Place a tower block from your supply under one of your knights. You may not use this action to make the castle taller than its surface area.